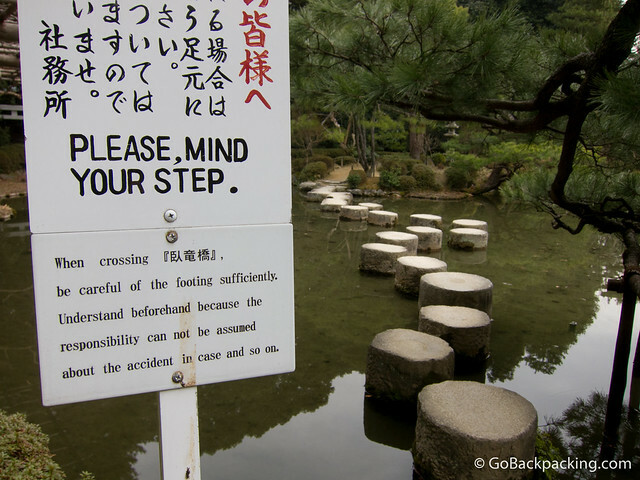 A sign warns visitors to be careful when walking across the stone walkway. 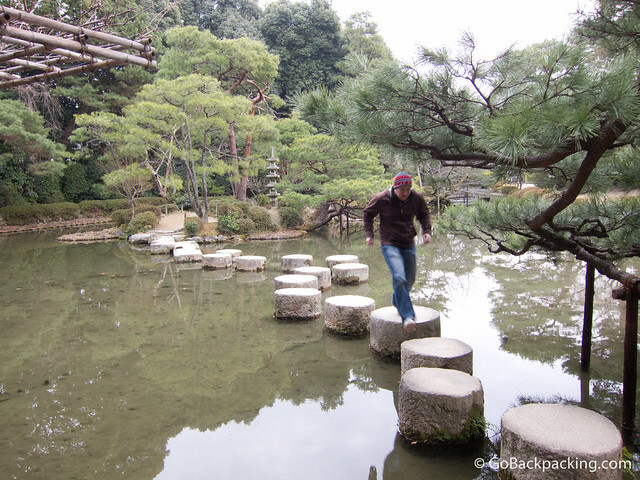 There are a lot of hidden benefits to visiting Japan in the off season, but visiting the gardens is not one of them. I soon discovered most, if not all, of the shrines and temples I visited featured meticulously cared for gardens, only in Winter, they all lack flowers (and color). In Kyoto, I visited the popular Heian Shrine with the express purpose of finding the location where a scene from Lost in Translation was shot. Specifically speaking, Scarlett Johansson's character is seen skipping across a stone walkway over a pond. Earlier in Tokyo, I'd already enjoyed a Suntory whisky at the Park Hyatt a la Bill Murray's character. Take 1: running across the stone steps. To access the shrine was free, if I recall correctly, however you needed to buy a ticket to visit the gardens. And guess how many people pay to visit Japanese gardens in Winter? Answer – not many, so I had the whole garden to myself. When I happened across the stone walkway from the movie, I recognized it instantly, and used the opportunity to have a little fun with my camera. I balanced it on a sign post, set the auto-timer, and then began to recreate scenes from Lost in Translation. Walking across the path was boring in the photos, so I jogged. Then, since I was absolutely alone, I also took a moment to meditate…well, at least long enough to snap the photo which makes it look like I'm meditating. 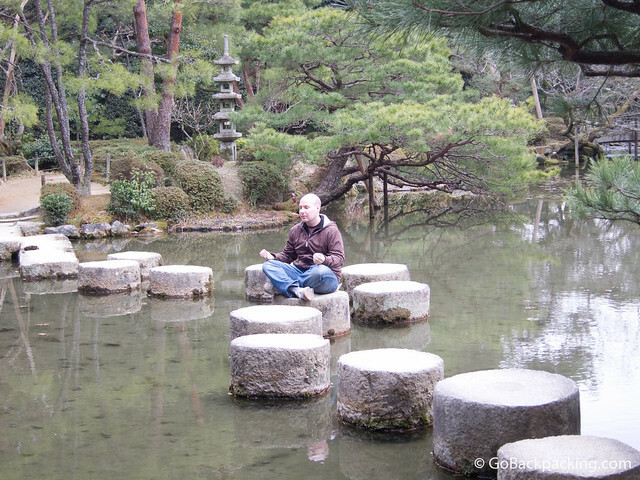 A moment of meditation in the gardens of Heian Shrine. The impromptu photo session was worth the price of admission (which was in the area of $5), though I don't recommend paying for Japanese gardens in Winter. Love it! I just watched this movie for the first time a couple weeks ago and loved this scene. It makes me want to go to Japan even more.